Looking to Purchase a Pool Cover System? Click here to complete our online questionnaire for a free estimate. If you already own a pool cover system and would like to be part of our pool cover rental network, please click here and complete the form in order that we may contact you. Looking to Rent a Pool Cover System? Although we do not directly offer pool cover rentals, we will try to connect you with a company that can rent an over pool event flooring system for your special event. 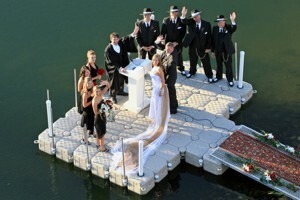 Pool cover rentals are ideal for weddings, soirees, corporate events, social gatherings and other special occasions. Click here to complete our online rental questionnaire. Purchase an Over Pool Event Flooring System - At Walk On Water we sell over-pool event flooring systems and components to create functional event space over the pool. We consult with our clients first, determine their needs and propose the pool cover system that is right for them. We offer different pool covering systems for a variety of situations. 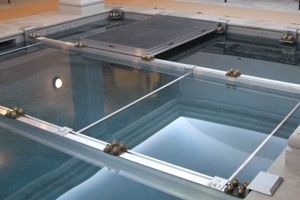 Surfaces range from acrylic plexiglas pool covers, poly resin pool covers, and other over pool flooring systems. Click here and complete our online questionnaire for a free estimate. 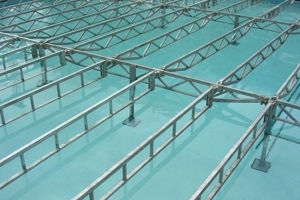 Uniquely designed, the 212 Understructure Support Brackets enable simplified, sturdy, and safe construction of any pool cover’s understructure onto which any surface can be built. We are pleased to announce the launch of our newly created and patented 212 understructure support bracket shown below and to the left. The 212 brackets simplify construction of the understructure, by providing a place to hang all supporting wooden joists. 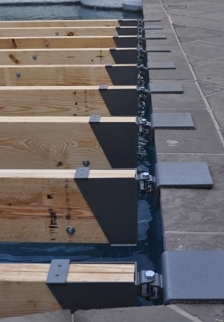 Spanning any pool with wooden joists has never been so easy. Our brackets can be securely fastened to the end of the joist in less than 2 minutes per side. 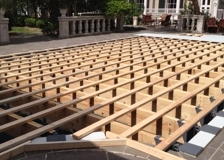 Because the brackets enable the user to lower the temporary pool cover structure inside the perimeter of the pool, the finished platform sits within 2 to 3 inches above the surrounding deck level. If you are looking to locate a company to provide rental of an over pool event flooring system, please forward your information to us. We may be able to locate a company in your area to assist with your needs. Click here to send us your information. 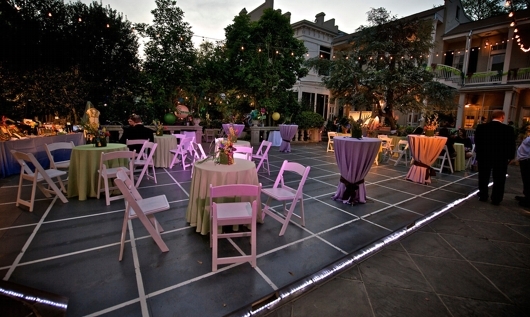 We can help turn virtually any swimming pool into functional event space. Strong enough to hold a private party on, and for special events, corporate events, or any other activity you care to mention. Other Pool Covering options include the Expandable Trussing System, the Modular Style Pool Cover, and Floating Pool Covers. 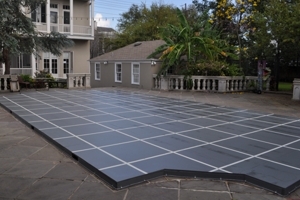 Working alongside architects, pool builders, and homeowners, Walk On Water will assist with the design and fabrication of your chosen custom built over pool floor system. Simply provide us with a minimal amount of information to get the process started, by completing our online questionnaire. Click here to complete the online questionnaire.